What are some elements of productive pasture management? Proper soil health and fertility will ensure a good growth environment for pasture species, both forage and legume. Manure can help to improve and maintain soil fertility by providing needed nutrients, (N, P, and K) and organic matter. These nutrients will help promote growth of grasses and legumes while organic matter from manure will help to provide soil structure, protection against erosion and improve natural soil fertility. Choosing the appropriate grass and legume species will help optimize forage management and pasture growth. Exercise or sacrifice areas are designated locations for feeding, watering, exercise and relaxation for times when pastures are not accessible due to lack of growth (winter or drought), flooding, etc. Generally, these areas have little or no vegetation. It is important that manure not be spread in these areas. They are meant to be sacrificed for animal activities in order to protect the remaining pastures. Runoff from sacrifice areas should also be managed to reduce the risk of water pollution caused by sediment and nutrients from these areas. Water is of concern whenever it is in short supply or contamination is suspected. Water serves to cool the animal and works as a solvent or buffer for chemical reactions in the body. When the weather is hot in the summer, an animals’ requirement for water will increase. Requirements vary with stress, weather conditions, heat, cold, disease, productive state, work, exercise, etc., as well as the water and salt content of the feed. Often the first sign that water consumption is inadequate is when animals stop eating. Water is essential to maintain adequate feed consumption. Grazing animals on pasture need to be supplied with adequate water for drinking. 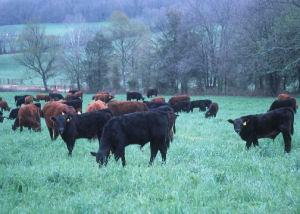 Livestock on pasture will tend to congregate near or in riparian areas that have greater access to shade and water. These areas may also provide greater water quality risks from manure runoff, trampling and compaction, overgrazing, and mud accumulation than areas more distant to water. The management and design of these riparian areas is critical for maintaining a proper pasture grazing environment with adequate feed and water availability and promoting optimal environmental quality. A Guide to Managing Pasture Water provides some excellent guidelines for maintaining water quality in riparian settings. This pasture management section provides information about proper pasture management in order to improve water quality by reducing manure runoff and soil erosion risks that may be associated with poor pastures. The following links provide more specific information.